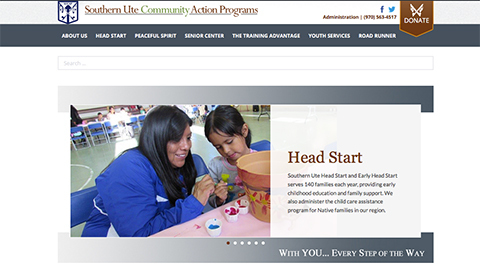 For Southern Ute Community Action Programs (SUCAP) in Ignacio, Colorado, we worked together on a website redesign to accommodate the complex needs of this large, multi-division organization. Their site uses top-level and sub-level navigation to house information relative to the different divisions that SUCAP oversees. With so many moving parts in mind, we designed a custom website back end to streamline the many different tasks that SUCAP employees perform on a regular basis, such as updating division news posts, providing downloadable forms and documents, and posting current job openings. 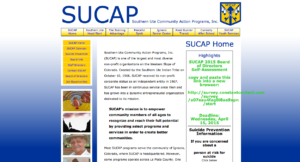 The final product resulted in a large, yet easy-to-navigate website that showcases SUCAP’s divisions and programs, and provides resources and information to the families and community members they serve. SUCAP went from this outdated HTML-based website to a modern, responsive site with a customized content management system.